SUE SUCHOCKI is an Emotionologist providing awareness, ideas and answers through Applied Techniques Training. 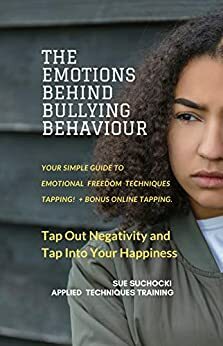 As a certified Emotional Freedom Techniques - Tapping practitioner and qualified trainer, Sue has been on a journey to decrease stress and anxiety in her own life and the lives of others. Sue brings to the forefront the emotions behind your thoughts and actions using EFT-Tapping to help find your happiness by tapping into, 'The Emotions Behind Bullying Behaviour'. and ways to increase self-awareness to fulfil their own needs. UNDERSTAND the emotions of the person and find answers to allow for changes at home, school and in the workplace, or with online cyberbullying without blaming the person using bullying behaviour, being bullied or the bystander. "HURT PEOPLE, HURT PEOPLE". Yehuda Berg. TAP into your resilience to find your happiness. a calming effect on the amygdala, the stress centre of the brain and the hippocampus, the memory centre of the brain to lessen the fight or flight response". Dr Peta Stapleton PhD.